Podopterotegaeus tectus, from Canadian Biodiversity Information Facility. 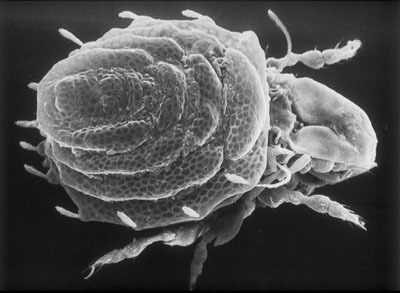 The Polypterozetoidea is a relatively small group of disparate oribatid mites found in cool habitats in temperate regions or at high elevations (Norton & Behan-Pelletier 2009). Characters (from Norton & Behan-Pelletier 2009): Adults with scalps present or absent. Prodorsum with broad lamellae, translamella present or absent, without genal notch. Tutorium present. Pedotectum I present; patronium present or absent; pedotectum II present or absent. Dorsophragmata and pleurophragmata absent. Subcapitulum diarthric or anarthric, with modified chelicerae and rutella; subcapitular membrane with tectum; palpal eupathidium acm separate from recumbent solenidion. Notogaster often obscured by dirt adhered to cerotegument; with humeral apophysis that may resemble pteromorph; with or without medial apophysis. Six pairs of genital setae. Immature of Polypterozetes cherubin eupheredermous; hysterosoma usually obscured by dirt adhered to cerotegument; quadrideficient; seta d present to tritonymph on tibiae and genua when respective solenidia present (immatures of other species unknown).